The National Gay & Lesbian Chamber of Commerce (NGLCC) advocates on behalf of lesbian, gay, bisexual, and transgender (LGBT)-owned businesses. The organization initiated the United States’ first government-certified LGBT trade mission in 2012 by traveling to Bogotá, Colombia—one of the largest importers of U.S. goods. The mission involved exploring export opportunities between North American-based LGBT suppliers and Colombia, as well as establishing an NGLCC affiliate organization. NGLCC commissioned Ahlers Designs to create a custom Challenge coin in honor of its Colombian business partners and the significance of this historic event. Gail Ahlers designed and created the coin by casting it in durable pewter. 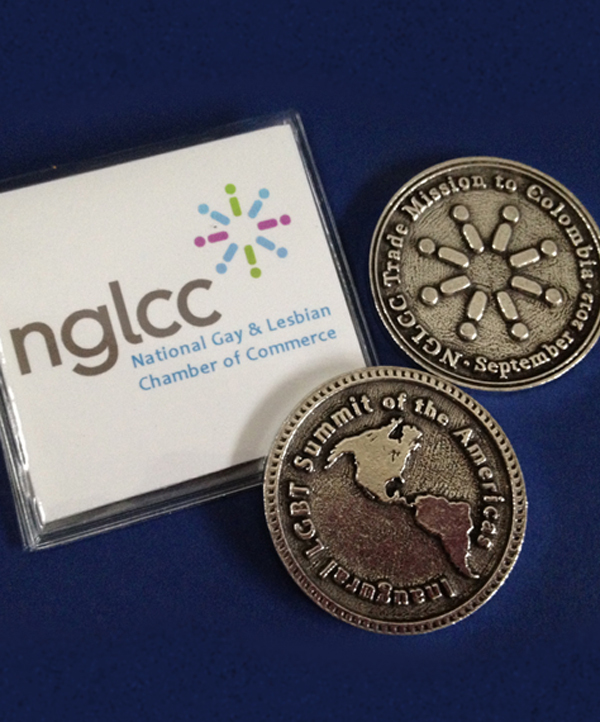 With the NGLCC logo appearing on one side and a geographic map of the Americas on the other, the Challenge coin expresses the connection between two countries’ business practices in the name of prosperity through diversity. What are Challenge Coins? Challenge coins have been created and shared in the United States since the early 20th century to build camaraderie and express pride and fellowship. Traditionally used within many military units, Challenge coins are highly valued and kept for a lifetime. Today, their symbolic power has taken hold beyond the military. These coins commemorate a variety of pivotal, historic events, and they embody exceptional American quality and craftsmanship.